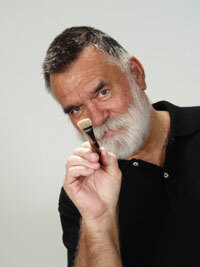 Chuck Baird, an amazing Deaf artist died February 10, 2012 after a four-year battle with cancer. Chuck Baird was often referred to as a playful mind and a generous heart. I was able to meet Chuck as he visited with a group of young Deaf and Hard of Hearing children. I have to admit his playful mind and generous heart is what stuck out to me the most while I watched him totally pull the children into his wonderful world of art. Chuck was born deaf 64 years ago in Kansas City, Missouri. He graduated from Kansas School for the Deaf in 1967 and attended Gallaudet University for two years. Later he attended Rochester Institute of Technology's National Technical Institute for the Deaf (NTID), where he played football for their team for only four games. He decided to give up the sport for his love of art instead. Robert Baker of NTID’s Dyer Arts Center described Baird best as “a giant of an artist and a wonderful man.” Chuck’s time at NTID also included time spent in the Drama Club. He acted in several productions and designed and painted several sets. One of his most memorable plays was “King of Hearts” where each night Chuck would recreate the entire set in front of a live audience! Later in life Chuck worked for DawnSignPress as an in-house artist creating a number of Deaf-related works. Chuck’s works were known for the genre called De’VIA, which stood for Deaf View Image Arts. This genre explored the perspective of Deaf people and their experiences in a hearing world. Deaf and Hard of Hearing children of all ages loved to see their language, American Sign Language, being used in art to express their point of view. "Crocodile Dundee" Copyright Chuck Baird, 1992. In this Chuck Baird painting, notice the reflection of the crocodile is the sign for crocodile. To see more of Chuck Baird's paintings, visit Chuck Baird's website. Rest in Peace Chuck Baird, your talents will live on through the many, many people you inspired with your great perspective and zest for life. Photo of Chuck Baird: Olathe, Ken. Deaf Cultural Center. Original Website. Learning signing language as a foreign language is a very good option for hearing students. It greatly enhances their understanding of languages. It increases their ability to communicate in a variety of situations when a spoken language is not an option. And American Sign Language is the fourth most used language in the United States. We love the idea of a world where more and more people are able to more effectively communicate with our vibrant Deaf and Hard of Hearing population. That has been a goal of our web site from day one! Across the United States, many high schools are having to rethink the way they are currently running their foreign language programs. Many states are now requiring students in their 2014 graduating classes to have two years experience in a foreign language and many more are looking at requiring three! This has left school districts scratching their heads on how to meet these new requirements. Many smaller schools have just one foreign language they currently offer (generally Spanish), but are now struggling to figure out how to expand their offerings. At Signing Savvy, we see this as a perfect opportunity for those who are interested in sign language to go to their school boards and ask for them to consider introducing sign language as a foreign language option to their school's curriculum. The school's administration will have to look into their own state's requirements for foreign languages. Many states do already accept sign language as a foreign language option. The administration will also have to work with the state to establish the credentials of the people who can teach the classes. In many states, teaching of sign language courses at the high school level can be done by a certified interpreter that also has a bachelor's degree or a teaching certificate. There is no better time than now to get involved in your local school's education. We will do what we can to help you along the way, including continuing to provide a complete sign language resource that can help both students and educators in learning and teaching sign language. ASL is offered as a language in my High School and I love it. I have taken ASL for three years so far. I can sign well and understand others when they sign. I took Spanish for three years in High School, and two years in Middle School and I even went to Spain...but I still struggle to have a conversation in Spanish. I find learning ASL to be really rewarding and I love learning about Deaf Culture. I hope more High Schools adopt ASL into their language programs. I work at a private Christian School and we have been teaching ASL in the middle school for 3 years. One of our teachers had a deaf sister so he taught it at first. He moved to FL so now I am teaching the class as an elective. It's exciting to see my students progress in their learning. This site is a great help to me, as I am still learning myself. I'm taking ASL for my language... and it's absolutely incredible. I'm hearing impaired, but I've never explored the deaf part of myself. Learning about deaf culture has been so rewarding! And, unlike the semester of Spanish I took, I actually can have a conversation in ASL after only 1 semester! Now, I better stop so I can study for my ASL final exam!